Go team! L-R: Stephanie Brake, Krysten Brake, Kurt Sampsel, Gina Schuette, and Whitney May. Gina and Stephanie learned about our Building a New Election Website course in May, when CTCL’s Whitney May and Kurt Sampsel presented at the annual conference of the Kansas County Clerks and Election Officials Association in Manhattan, Kansas. Before long, Whitney and Kurt were traveling to Kinsley to help the Clerk’s office get started setting up the website template and filling it with content. The website template is designed to meet the needs of both election officials and voters. Based on research about how voters look for civic information online, the template prioritizes answers to voters’ top questions and incorporates principles of plain design and plain language. The template is also mobile friendly, making it easy to use on a smartphone or tablet. Plus, it’s easy for election staff to maintain throughout election cycles. Working with Gina, Stephanie, and Clerk II Krysten Brake, we got the new Edwards County Elections website ready in just 2 days. Now, visitors can quickly and easily find what’s on the ballot, view election results, locate their polling place, and more. In addition to helping the Clerk’s staff set up the website infrastructure, we covered best practices in civic communication, introduced basic web analytics, and helped the staff create a new Facebook Page for the Clerk’s office. Edwards County is the latest jurisdiction to join our growing list of election authorities that are using our website template. Moving forward, we’re excited to work with more officials in Kansas and beyond to help them create straightforward, effective election websites to better serve their communities. Do you need to build a new election website, or would you like to make improvements to your current one? We’d love to help. Get in touch at courses@techandciviclife.org to tell us about your needs. This past July and August, CTCL offered for the first time our professional development courses for election officials in a convenient online classroom. To put the courses in the reach of everyone, we made them just $30.00. Even though it was our first time delivering curricula online, our Summer School program was a big success, bringing together over 100 participants from California to Rhode Island and everywhere in between. CTCL has been offering professional development courses since our founding in 2015, but before Summer School, they were only provided in person at election offices. While the personal touch can be great, these in-person courses bring travel and lodging expenses, and they require participants to take hours away from their normal work. We’ve known that quick, affordable, online courses could help us bring our training to more people. In late spring of this year, with the guidance and insight of our Advisory Committee, we prepared condensed, 90-minute versions of our most popular courses, selected a price, and started to promote them. We also created engaging, shareable videos and graphics to help spread the word through social media. We offered the 4 courses on successive Wednesdays in July and August at 1:00 p.m. Central, hoping to involve participants from all time zones. For our video conferencing platform, we used Zoom, a straightforward program that allowed us to share slides, send polls, chat with participants, and produce video recordings for later reference. Not knowing how much engagement we’d get, we initially decided that if 5-10 people would sign up for each of our 4 courses, we’d declare Summer School a success. But ultimately, we ended up with 10 times that number: our most popular course had 74 participants, and even our least-attended course brought in 47 people. Who were the participants? Our 102 students came from 34 county offices, 8 municipal offices, and 3 state offices that administer elections for, in total, over 17 million American voters. Big election authorities like Dallas County, Texas (with 1.29 million registered voters) attended Summer School, as did small jurisdictions like the city of Houghton, Michigan (home to 3,056 registered voters). Responses to the courses have been positive, with many participants sharing plans to immediately use what they learned. With the positive experience of Summer School behind us, we’re already thinking about plans for future online courses. We hope to offer these same 4 courses again in the winter or spring of 2018, and in addition, we’re in the process of developing new curricula based on feedback that we’ve received. Stay tuned for details as we prepare to expand our online course offerings. To share your ideas or requests for future courses, email us at courses@techandciviclife.org. This summer, we’re offering our 90-minute professional development courses for the first time in a convenient online classroom. It’s an easy, affordable way for you to get together with election officials from around the country while learning new skills to better serve your community. We’re calling it Summer School. To help put the courses within everyone’s reach, we’ve set a price that’s sure to fit within your budget: just thirty bucks per course. And to kick off Summer School, we’re also offering an orientation that’s free for anyone to attend. The courses will be held on Wednesdays in July and August at 1:00 p.m. CST. For more details and to sign up, check out our Summer School page. Want to read more about our curricula? See our Professional Development Courses page for more information. 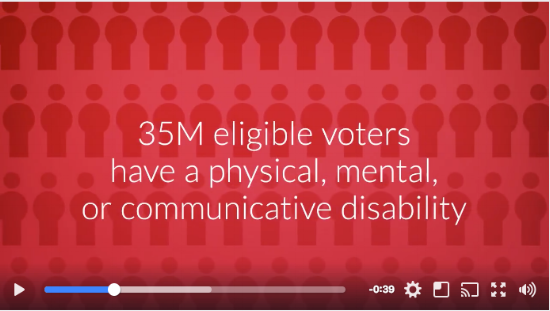 How can election officials use data to inform stakeholders? How can they make the most of election information they already have, and how can they make collecting new data a regular part of their work? How might data visualizations help to promote transparency and persuade decision makers? The Center for Technology and Civic Life’s Tiana Epps-Johnson, Whitney May, and Kurt Sampsel have joined Monica Crane Childers from Democracy Works to create 2 video workshops with the Election Assistance Commission (EAC) that tackle these questions. In the first video we talk about the importance of creating a data culture in election offices. That means incorporating data work into the everyday processes of election staff. The roundtable discussion includes topics like fostering a deeper understanding of election data sources and the long-term value of performing a data inventory. The second video covers data visualizations and how they can distill complicated content into a compelling story about election administration for a diverse audience. We give special attention to the power of Excel and Tableau Public -- 2 common programs that election officials can use to visualize data -- as well as making visualizations accessible for everyone. A third video -- to be produced by the National Conference of State Legislatures -- will focus on using data to ground policy and budget discussions. It will be released later this summer. Check out all the helpful videos produced by the Election Assistance Commission on the EAC YouTube channel. Stay tuned for additional videos in the “Tech Time” series to be released throughout the year. For the latest on EAC resources, follow along on Twitter using #BeReady16. In February our Government Services team traveled to California, where we trained local election officials, helped facilitate a usability test for the Civic Engagement Toolkit, and spoke on a panel at the Future of California Elections annual conference. Over the course of our 10-day trip, we soaked up sunshine and information about elections in the Golden State. We began our trip working with the California Association of Clerks and Election Officials (CACEO) to organize 2 trainings for their members. The first training -- for election officials in the northern reaches of the state -- took place at the Sacramento County Registrar’s office. The second training -- for election officials in southern California -- was hosted at the Orange County Registrar’s office in Santa Ana. Overall, 56 California election officials attended the trainings, and we used the hashtag #CACEOsocial to connect with each other on Twitter. Tiana Epps-Johnson teaches Twitter mechanics in Sacramento. Based on the post-training feedback we’ve received, #CACEOsocial attendees most valued the the information on Twitter metrics and the introduction to free design software. They also said they planned to refer back to their participant guide -- a handbook we created that provides details on the topics we covered and resources to help in their outreach efforts. In feedback, we also heard that folks are interested in learning how other social media platforms can be used to communicate and engage with people in their communities. Kurt Sampsel discusses ways to measure voters' informational needs in Santa Ana. Are you looking for professional development opportunities for your election office or association? Our government services team offers customized training for local election officials across the country. Contact us at hello@techandciviclife.org so we can work with you to plan your next learning event. A few days later, in Los Angeles, we met with project partners, the Center for Civic Design, to work on the Election Toolkit. The Toolkit is a website that will feature tools, along with step-by-step instructions, that have been recommended and tested by local election officials. The Toolkit will empower election officials, regardless of their resources, to use tools and programs so they might better communicate with and engage the people they serve. Since receiving funding from the News Challenge on Elections by the John S. and James L. Knight Foundation in 2015, we’ve been busy gathering information from the field, prioritizing concepts, and designing the Toolkit website. Our aim is to have a website for the Toolkit that is useful, usable, and inviting. Usability testing helps us achieve this goal. By observing how people interact with the site and navigate content, we are able to identify what’s working and what’s not, and then make improvements. Nancy Frishberg facilitates usability testing in Los Angeles. The next round of usability testing will be in April, and we plan to publicly launch the Toolkit website in early summer. Do you want to get involved with the Toolkit? Email us at hello@techandciviclife.org to find out how, and keep up with the latest Toolkit news on social media with #ElectionTools. Finally, we continued to enjoy Los Angeles while attending the Future of California Elections (FoCE) conference. FoCE is a collaboration between election officials, civil rights organizations, and election reform advocates to examine and address the unique challenges facing the State of California’s election system. The organization’s twin goals are expanding participation and modernizing elections in California. Karla Zombro, Jess Jollett, Whitney May, Eren Mendez, and Kenya Parham at the 2016 Future of California Elections conference in Los Angeles. We were honored that our Director of Government Services, Whitney May, was invited to speak on the panel “Moving the Electorate: Reflections and Insights on Civic Engagement”. She joined moderator Jess Jollett and fellow panelists Eren Mendez, Kenya Parham, and Karla Zombro to discuss strategies for engaging historically disenfranchised communities. The conference program was stacked with informative and thought-provoking panels. A frequent topic of discussion was the lessons that have been learned through the voting models of Colorado and Oregon. Colorado Secretary of State Wayne Williams and Oregon Secretary of State Jeanne P. Atkins shared experiences and challenges from their states. There was also a lot of attention given to making voting information more accessible, engaging young people in civic life, and finding new solutions to election funding. We encourage you to join the ongoing conversation on Twitter using #FOCE2016. Overall, our time in California was a golden opportunity to learn with people who care about democracy. We also enjoyed wearing short sleeves in February. For this experience, we extend our gratitude to CACEO and all the election officials who joined us in Sacramento and Santa Ana to make the trainings a success, the Center for Civic Design and election officials who participated in the second round of usability testing for the Civic Engagement Toolkit, and FoCE for their vision and leadership to bring together diverse stakeholders and tackle the most pressing issues facing California’s elections. Although once French territory, Missouri is now synonymous with middle America. In fact, the mean center of U.S. population is located here, in a tiny town called Plato. It’s also the home of jazz, barbecue, the Gateway Arch, and 5 major league sports teams. Missouri is famously known as the Show Me State, but how well is it doing when it comes to showing important election information to voters? It’s true that the starting point for the Pony Express was located here, but in the twenty-first century Missourians deserve to have some faster communications tools in place. We’ve recently done research on Missouri that demonstrates that there are some big gaps when it comes to providing civic information in the state. Fortunately, there are folks working to close them. In particular, we were encouraged by the work of Laclede County Clerk Glenda Mott and her staff. With the help of our election website template, Laclede County is providing essential election information to the community. Along with Glenda, we had the opportunity to tell the story of Missouri’s election websites – or the lack of them – to radio listeners in the Ozarks region. We first met Glenda at the 2015 Midwest Election Officials Conference in Kansas City back in October. She asked our team to do an assessment on her current election website, and we found that their old site wasn’t terrible, but it did leave some things to be desired. For instance, we found that the site didn’t answer important voter questions like “When’s the next election?” and “What’s on the ballot?” On top of that, Glenda’s staff told us they felt the site was hard for voters to navigate and hard for them to update and maintain. Glenda decided that she wanted to create a new election website for Laclede County, and we agreed to travel to her office in Lebanon to train her staff and help them get their new site off the ground. 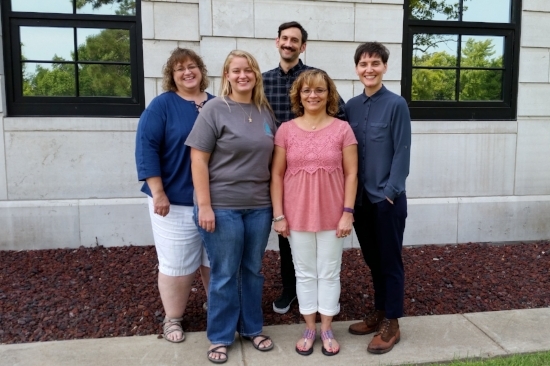 This in-person training meant that not only would voters get a new election website, but the Laclede County Clerk’s staff would also learn some new skills regarding web publishing and providing civic information. The Laclede staff members were hard workers, and soon www.lacledevotes.org debuted! In preparation for our trip to the Show Me State, we did some research on the presence of election websites in the state, and we found that there are many places in Missouri that are a lot worse off than Laclede County was. We repeated the study we did on Illinois a few weeks ago for Missouri. But this time around, we started with 2012 website-presence research done by the Center for Civic Design, and we updated it. It seemed fair to assume that jurisdictions that had election websites in 2012 would still have them, so we focused our attention on those jurisdictions that didn’t have a site in the earlier CCD survey. We also took a hard look at a number of election websites that CCD had described as “minimal.” In some cases, we felt that they were so minimal as to not qualify as an election website. We made the judgment to define an election website as a dedicated page, or collection of pages, that provides more than just one or two pieces of election information. In other words, we decided that a county clerk site that just posts election results or provides a link to the Missouri Secretary of State’s “Voter Registration” page shouldn’t qualify as an election website. Ultimately we found that of the 115 local election authorities in Missouri, 52 – or 45% – do not have an election website. This is actually a much higher number than we found in Illinois, where the figure is about 32%. Below is a map showing, in red, the counties without election websites. Unlike Illinois, there doesn’t seem to be a regional pattern to explain which Missouri counties lack an election website. The 52 counties are in the north, south, and central regions of the state. The only noticeable trend in the geographic distribution is that the areas surrounding Missouri’s major metro areas – St. Louis and Kansas City – have websites in place to help voters. Like we saw in Illinois, population seems to play the biggest factor in predicting whether or not a county will have an election website. Of the 20 counties with the highest population, only 2 (10%) don’t have a website. On the other hand, of the 20 least populated counties, 15 (75%) have no election site. All told, this means that there are approximately 865,652 Missourians living in a county without an election website. That’s a little more than the population of the city of San Francisco. Fortunately, Laclede County provides a great model for local government taking charge to help provide voters with more civic information. We believe these 52 counties – where the need is even more urgent – can follow in Laclede’s footsteps. While visiting Missouri, we were invited to appear as guests on the weekly radio show Making Democracy Work, which is produced by the League of Women Voters of Southwest Missouri along with KSMU radio in Springfield. Our Government Services Associate, Kurt, appeared on the show along with Glenda. Allison Cash of the League was the interviewer, and she asked questions about CTCL, the new website being built by the Laclede County Clerk staff, and the broader problem of election websites in Missouri. Allison asked about the presence of election websites in Missouri. “There’s a big problem of civic information in this state,” Kurt suggested, citing the number of counties without sites. The interview broadcast on KSMU on December 14. You can listen to it by visiting the KSMU website. All in all, our work in Missouri identifies challenges as well as solutions. We found some big gaps when it comes to providing civic information in the Show Me State, but we also met smart, hardworking public servants and advocates who want to do their part to bolster informed participation in the democratic process. If you want to read more about the election website template and training options that we offer, visit our professional development courses page. With questions about our research on Missouri, reach out to Kurt at kurt@techandciviclife.org. On November 18th Kurt and Whitney hosted an informational webinar about CTCL's election website template. Over the course of the webinar they told the origin story of the website template, discussed the different training options that are available, demonstrated how to use the website, and shared testimonials from two election officials who are currently using the CTCL template. They wrapped up the webinar with a Q & A session, fielding questions on topics like how the template prioritizes election information and how to embed materials on the site. After the workshop your election office will have a modern, voter-friendly website that's ready for 2016. Seats are limited, so email Whitney to reserve a spot for your election office today. If you have any questions about the website template, training options, or webinar, email Kurt. Illinois -- known as the Land of Lincoln, the Prairie State, and the home of the Third Coast -- is frequently described as a bellwether for American culture, as a microcosm of the nation as a whole. There are good reasons to believe that’s true. With Chicago, Illinois has the third largest city in the country, but it also has more soybean fields than almost anywhere. And while the state’s urban north stands as a bastion of liberal politics, counties downstate are reliably conservative in their voting patterns. In fact, when it comes to voting, there’s another way in which Illinois is representative of the country overall: the presence – and absence – of local election websites. For their 2012 report “Usability of County Election Websites,” Harrell, et. al. studied a nationwide sample of local election websites and found that although voters are looking for election information online, about a third of county election offices (31.6%) don’t have a website. We wanted to discover how this dynamic is playing out in Illinois. Is a lack of election websites a problem for Illinoisans? We found that some election offices have excellent websites, while others have minimalist ones. In some cases, we found that a county in question has a general county website but isn’t providing election information on it. In other cases, we found no web presence at all. All told, we concluded that 31 of the 110 authorities in Illinois lack any website that provides election information. This figure – which amounts to 28.2% -- is quite close to what Harrell, et. al. found in their 2012 national study. 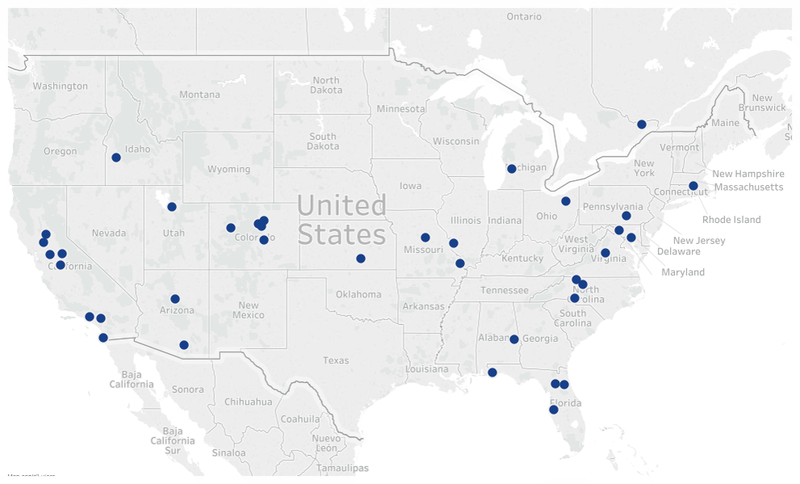 Below is a map showing the counties without websites. To better understand what’s happening, we broke the issue down by region, income, and population. For whom is not being able to access an election website a problem? And why? Between Chicagoland, the Quad Cities, the central prairie, and Little Egypt, Illinois is a state of several different regions, each with its own culture and its own set of resources and challenges. Unfortunately, we found that the quality and quantity of civic information has a regional bias. In other words, searching for an election website in vain is an experience that’s not distributed evenly across the Prairie State. When it comes to creating and maintaining local election websites, some parts of the state are doing excellently, while others rate as poor. Illinois’s 110 local election authorities – its 102 counties plus 8 municipal offices – are divided up into 4 regional zones corresponding to north, south, east, and west. We found that civic information online is much more plentiful in the northern and eastern regions of the state than in the western and southern portions. The biggest contrast is between Zone 3, where nearly all (95%) election offices have a website, and Zone 1, where not even half (47%) do. It seems clear that many local election authorities in Zones 1 and 2 have a long way to go to close the gap with Zones 3 and 4. But the challenge is not merely one of initiative or determination. Instead, financial resources and population seem to play a role. While there are multiple factors behind the strength or weakness of local civic information efforts, one of the most significant ones seems to be wealth. Zones 1 and 2, which have much room for improvement when it comes to publishing election websites, also have lower median incomes than do Zones 3 and 4, where penetration of election websites is almost complete. In addition, among the twenty wealthiest counties, only two local election authorities (10%) lack a website, whereas among the twenty counties with the lowest median incomes, eleven (55%) have no election information online. The problem is not just due to resources or wealth, though. Actually, population seems to play an even more significant role. Of the twenty least populous counties in Illinois, 15 (75%) do not have websites. On the other hand, of the twenty most populous, 20 (100%) have a website. In other words, counties with smaller populations seem much less likely to publish election material online than more populous ones. We found that 3.4% of the Illinois population lives in a county without an election website. That may not sound like a lot, but that’s 439,727 people. To put that into perspective, that’s approximately the population of Raleigh, North Carolina or Miami, Florida. Though they’re mostly small, these 31 counties matter. We believe they should be able to have an election website that they’re proud of, that serves their community, and that helps to promote civic engagement among their citizens. Overall, our research on Illinois’s 110 local election authorities and their website status shows that Illinois is emblematic of the problems with civic information throughout the U.S. But just as Illinois is a microcosm for the nation, it might also provide a model for spearheading change. To help set change into motion, we’ve designed an election website template that’s specifically designed for the needs of Illinois counties. The template comes ready with language on Illinois election law, on the state’s process for voter registration, and so on. It also includes Illinois election website posting requirements. The template is envisioned as a starting point to help counties in the state who don’t have a website. Check out the website template and let us know what you think! To inquire about the template or our Illinois election research, reach out to CTCL’s Government Services Associate, Kurt Sampsel, at kurt@techandciviclife.org. CTCL is launching a first-of-its-kind training program in building and maintaining an election website. Following the success of the election website pilot project in 2014 and online prototype testing earlier this year, we’ve created new learning opportunities for local election officials who want to build an effective, straightforward election website with a modern look and feel. We’re offering two different learning approaches to choose from. For officials seeking in-person instruction, we offer tailored training at your election office. If you’d prefer an independent study, there’s a self-paced online course. Learn more about the website building course, including details about the website template and curriculum. Gain new tech skills and modernize your website in advance of the 2016 elections. Kurt Sampsel is excited to join CTCL as its newest team member. With a background in teaching, research, and journalism, he has a passion for fostering inventive thinking and for helping to promote political and civic engagement. To CTCL, Kurt brings 10 years of experience teaching at the college level, most recently at Carnegie Mellon University in Pittsburgh, where he also earned a Ph.D. In addition to leading a classroom, he enjoys designing new courses and curricula as well as providing supportive feedback to students on a one-on-one basis. In his time as a teacher and tutor, Kurt is proud of having had the opportunity to work closely with students from many different backgrounds, from teenagers to retirees. When he’s not working, Kurt is probably eating Chicago-style pizza – his favorite food, ever. Connect with Kurt at kurt@techandciviclife.org.